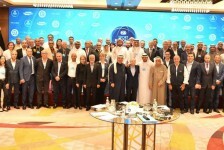 The conference, which was hosted by the Kuwait International Automobile Club in cooperation with the International Federation of Motor Vehicles (FIA) for three days, included several meetings, workshops and exploratory tours of the Kuwait City Circuit for cars and motorcycles to discuss proposals and common visions for developing the game as needed for the Middle East and North Africa. The President of the International Automobile Federation (FIA), Jean Todt, expressed his pleasure in his presence in Kuwait and his participation in the conference. He praised the great role played by the Kuwait International Automobile Club headed by Dr. Emad Boukhamseen and CEO Issa Hamza in developing the game at the regional and international levels. Todt praised the success of the conference and achieving all the desired goals through the exit of projects and new ideas to help further progress in motor sport. "You have achieved the desired success at this conference, which we discussed only 60 days ago. It is a very short period, but with your cooperation and the work of one family, we have been able to achieve this remarkable success," Todd said at the closing ceremony. "I would like to invite you to visit this wonderful city, which is of great importance to the region, because it has many tracks for all kinds of motor racing," he said. For his part, Vice President Mohamed Bin Sulayem praised the great work done by all. "You are the winners," he said. He added: professionalism and professionalism in everything related to the conference left a good impression for everyone, and we can not but thank everyone who contributed to this success. For his part, Chief Executive Officer of the Kuwaiti Automobile Club Issa Hamza said that the cooperation of all contributed significantly to the success of the conference, while apologizing at the same time for any shortcomings that may have occurred during the period of hosting. "We were invited to host the conference only two months ago, and it seemed difficult, but through joint work and positive attendance we succeeded, and we say welcome to Kuwait at any time. The director of the Lebanese Club for Tourism and Cars, Kaby Kricker, praised the successful activities of the conference, which witnessed the presence of all members of the Middle East and North Africa Association of cars, which contributed to the exit of many positive things that will develop the game in the member countries. Kricker thanked the Kuwait International Automobile Club and its sponsors for this outstanding hospitality, stressing at the same time that the conference achieved many goals set. He said: One of the most important goals we wanted to come out with recommendations to organize the Middle East Championship to climb the plateaus, Praise and encouragement of the majority. In her turn, the WRC Rally Committee official, Utah Kleinschmidt, expressed her great appreciation for the efforts to organize this prestigious conference, which is one of the most important events that contribute to the exchange of experiences and ideas for the benefit of motor sports in general. "I think the most important point in continuing the development of the game is the communication between the various federations and clubs, creating common goals that we are working together to develop," she said. For his part, a member of the Yemeni delegation, Tawfiq al-Shaibani, expressed his great gratitude to the hospitality which was received by the delegations by the organizers of the conference. Emad Boukhamsin. Al Shaibani said that the conference achieved outstanding success and crowned the efforts of all participants to come out with a number of recommendations and projects that will develop the game in the region. For his part, UAE Vice President Mohamed Bin Sulayem praised the great work done by all. "You are the winners," he said.